One of the earliest known chainsaw-like devices was called an ‘Osteotome’, and it was used to amputate human limbs in the 1830s. It worked by manually winding a handle attached to a sprocket, causing a serrated chain to move around a bar. PEA reporter Kiera Taylor explores everything old and new in chainsaws. The chainsaw has evolved dramatically since those somewhat grisly beginnings (and thankfully, so have modern-day amputation methods). Many inventors, such as Samuel J Bens, who patented the “endless chain saw” in 1906 to fell redwoods; James Shand, who was the first to patent a portable chainsaw in 1918; through to Andreas Stihl, who patented electrical and petrol-powered chainsaws in the 1920s, all contributed in one way or another to the machine we use to cut wood today. The MS 362 C-M by STIHL uses the company’s latest technological advancement, M-Tronic electronic management system. And the chainsaw continues its evolution to this day. As the name suggests, STIHL is a company deeply rooted in the chainsaw’s history, and according to STIHL Australia’s Product Manager, Andrew Dawson, despite its tradition of petrol-powered equipment, the biggest evolution can be seen in the rise of battery power. “We now have chainsaws powered by electricity, petrol, and of recent times, battery technology; which is not new to the industry but it is definitely new to STIHL as a manufacturer,” he said. Mr Dawson explained that consumer uptake on battery powered equipment was slow at first, but that people are now starting to realise the benefits. “Since STIHL Australia and the market have introduced additional units, the uptake is now rapidly increasing. Many consumers are very surprised at the performance of battery-powered product, especially the chainsaw. We are starting to see huge growth in the battery chainsaw line up,” he explained. “Also the cost of maintaining a battery product is far less than a petrol version, simply because there’s no air filter, there’s no carburettor, there’s no fuel tank, and there’s no fuel filter, so maintenance costs on battery products are far less than traditional petrol-powered machines,” he said. Mr Dawson explained that while consumers were slow to embrace battery-powered equipment in the beginning, so too were dealers. “Our retailers were reluctant to stock these products at first as our range was small and battery was very new. There was uncertainty as to whether the products would be successful. 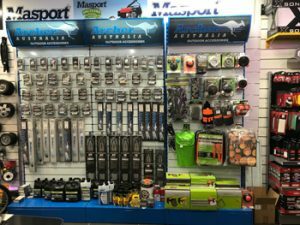 But now they love it, because they are seeing it as a very fast growth category in their store – the release of battery-powered products has introduced to the traditional mower store a broader range of customers,” Mr Dawson explained. “For example, once upon a time it was mostly only men who walked into mower stores because equipment was heavy, loud, messy, and they were petrol driven. Times have changed, and there are now more female homeowners buying and using these products. So the old days are gone and the introduction of battery and 240V electric products has attracted a broader range of customers to our Dealer network, which has resulted in them selling more products to more people,” he said. But none of this means that STIHL is neglecting its roots. Quite the opposite in fact; continual development to the company’s petrol range means the needs of the professional end user or acreage home owner are far from disregarded. “With our petrol range of chainsaws, with the technology we’ve put in, productivity is higher because there is less down time for servicing and repairs. Our petrol chainsaws have come a long way since the old-fashioned days of having to clean your filter after every use. We have air filtration technology now that basically means you can run a chainsaw for weeks, even months before the filter would need to be cleaned. In recent times our greatest technological advancement is M-Tronic. It’s a fully electronic engine management system that regulates the ignition timing and fuel metering, and takes into account external conditions such as temperature, altitude and fuel quality. It consistently ensures optimum engine performance, constant maximum speed and very good acceleration performance, and removes the need for manual carburettor adjustments,” Mr Dawson explained. “All of our machines are very low in vibration. 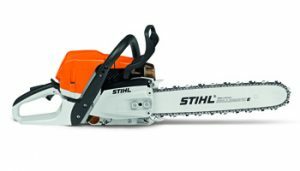 STIHL uses a combination of rubber buffers and steel springs on our chainsaws, so using the machines is now much safer because vibration has been reduced significantly, and an operator is less susceptible to getting Raynaud’s Disease, which can be caused by excessive exposure to vibration,” he said. Parklands’ new range of domestic and semi-professional chainsaws have hit the Australian market following months of extensive testing. Parklands Power Products has proudly been a 100 per cent Australian owned and operated company since the 1960s, supplying brands such as Tanaka, HiSun and Murray to the Australian market. 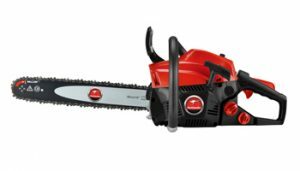 The company recently expanded its range by adding a series of Parklands bannered petrol-powered chainsaws to its line up, developed for the domestic and semi-professional user. The range has been rolling out through the company’s dealer network for the past six months, but according to Parklands’ National Sales Manager Sam Ruiters, it underwent extensive research and testing before hitting the shelves. “It’s one of the largest range of chainsaws that we’ve ever had under the domestic brand,” Mr Ruiters explained. “We’ve always had chainsaws, but previously with some of the suppliers in China they were only able to produce two or three models of chainsaws. Our current supplier has the capability, and the range, to offer anywhere up to 15 to 20 models, so it’s been the first time that part of our expansion is to be able to offer more models in each range. Previously we only offered two to three models of chainsaws, but this year we’ve been able to offer five from the one supplier,” he said. According to Mr Ruiters, although the saws were manufactured in China, the extensive testing process was carried out in Australia by commercial tree loppers. “The tree loppers are obviously commercial [operators]. The machines aren’t aimed at the commercial market but if they can stand up to commercial application it’s a very quick way of testing the chainsaw for extensive amounts of operating hours,” he said. “These machines are designed to last well above the cheap domestic machines on the market, but at a fraction of the price of traditional professional machines, and are backed with two years domestic warranty. For power, weight, balance, performance and longevity, we believe we have the right mix for best value,” he said. According to Mr Ruiters, the new range has contributed to considerable growth for the company despite a sluggish economy. “The chainsaw market in particular for us is growing, due to the value of our latest range of chainsaws. Having said that, the economic conditions at the moment are pretty poor. Obviously, there is still a surge through winter for chainsaws, but that surge has died out because of the price of saws. Sales have become all year round now. But I guess your traditional $2000 chainsaws, which we don’t sell, would still peak in winter,” he explained. The Triple Archer stand in action at True Fix Repair Service in Campbellfield, VIC. Throughout the past 12 years, JAK Max has cemented itself as one of Australia’s most passionate OPE suppliers. Selling over 10,000 lines to the lawn mower and chainsaw industries, the company has been enjoying global success with its latest venture, the Archer brand of chains and bars. As the exclusive distributor for Carlton chainsaw products throughout the past 10 years, the company witnessed more and more parts being discontinued as well as pricing becoming harder to work with, and according to JAK Max’s Archer expert, Sam Catena, they decided to take matters into their own hands. Mr Catena went on to explain that producing a top-quality product is the company’s highest priority, and doing so has led to phenomenal growth. “Our chain has been tested all over the world. It’s tested in Russia, in Finland and in the USA. It’s made in China in our own factory under strict scrutiny. We have professional metallurgists and experienced chain makers from America and all over the world keeping a close eye on our product to ensure that our quality continues, and to ensure it’s not perceived as a cheap Chinese brand,” he said. “We’ve sourced all our raw materials from Japan and Germany, and we will soon add a new state of the art heat treatment machine. We believe we will have a chain that’s equally as good as any chain out there, at half the price. The only reason for our price comparability is because we own the factory – there’s no middle man. PMD’s Managing Director Paul Duggan is constantly in China making sure that everything is running smoothly, and with PMD’s General Manager John Duggan living in China, based at the factory 24/7, the passion to make the best quality product we can is backed up by the devotion of its owners being in China permanently. Recently we have added new automatic assembly, new presses and new hi tech testing equipment to assist with our expansion plans,” he explained. Contributing to the company’s success, according to Mr Catena, is the Archer Stand and pre-packaged bar and chain combos, saving time for both retailers and consumers. “We’re trying to cut out time for the dealers – to save time in their workshop making chains,” he explained. “We want to be the number one saw chain and chainsaw aftermarket parts and chainsaw supplier in Australia,” Mr Catena said. For end users, maintaining a chainsaw has never been easier, and buying an entry level machine has never been more attainable or affordable. And with the latest round of chainsaw developments opening up the market to new users and customers, retailers could benefit from expanding their instore range, and displays, to cater to these users.